I've Got A Shabbat Feeling! "Iâ€™ve Got A Shabbat Feeling." is a joyous, toe-tapping, heartwarming musical celebration of Shabbat. This 45 minute recording has been welcomed to rave reviews by kids, parents and Jewish educators alike. A must have for your collection. 6. I've Got A Shabbat Feeling! 15. It's Shabbat And I Feel Good! "Iâ€™ve Got A Shabbat Feeling!" Her music has been welcomed to rave reviews by parents, educators and kids alike and is sold nationally. Andi serves as a Jewish music specialist and leads musical and educational Shabbat programs at several Jewish preschools in the Philadelphia area. Additionally she leads music programs at secular day care centers and preschools. Both a singer and guitarist, Andi has been delighting audiences of all ages with her high energy musical performances since 1991. With years of experience both performing and as a preschool music specialist, Andi really connects with the kids during her interactive programs. Her sincere and upbeat stage presence creates a warm, positive, captivating environment where the children join right in the fun! Andi has performed at hundreds of children's special events from libraries, preschools, synagogues and camps to Philadelphia's Please Touch Museum. Love it! It's fun and easy to remember. My granddaughter loves it! She sings it all of the time. My kids love the cd. That's all they want to listen to since we got it. I'm just amazed of how wonderful the songs are. Fun CD, teaches about Jewish traditions in a fun way and easy to remember the words. Toe-tapping, sing-along fun for enjoying shabbat! My 1-year-old preschool class loves this CD-we listen to it at our Shabbat party every Friday morning. The kids stomp and clap out loud. Thanks for making Shabbat so kid-friendly. Andi is awesome on CD and in person. Her music is soooo great and the kids LOVE IT. I bought it for my school and haven't taken it out of my car. My children love it. We listen to it over and over again - and not just on Shabbat. 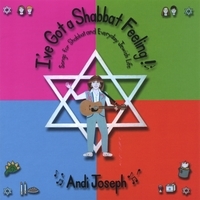 Andi Joseph: I've Got a Shabbat Feeling! Great CD. We use it every week for Shabbat. The kids love it! LOVE, LOVE, LOVE it!! Not to be missed! We bought this CD over 7 years ago! Our kids loved it! We recently bought it for our new nephew. It is just so great in every way! This CD was recommended by a few different people - we have played it at least once every day since it arrived! My 3 year old loves it - the songs are catchy but not annoying.